You would be hard pressed to not immediately recognise an eel, with it's long, snake-like body, tiny eyes, tiny pectoral fins and a dorsal fin that begins a third of the way down the body and extends right back to the tip of the pointed tail and along the underside of the belly. 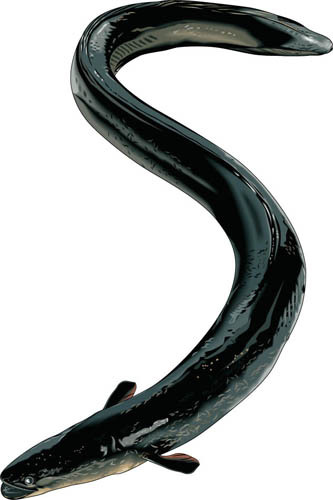 The head of an eel is very streamlined and small, with the mouth full of rows of tiny teeth. Colouration varies. They tend to be a yellow/brown but this changes to a metallic silvery bronze before the eel makes its arduous journey to the sea to breed.